Live from the heart of Sun City Center is Peter Swartz, left, owner of WSCQ FM radio with volunteers Judy Long, Elysa Hendricks, Vern Hendricks and Frank Vetrone. The station currently has 11 volunteers to help in its operation 24-7. At 96.3 FM, the station focuses on Greater Sun City Center. Back in a March feature article, Peter Swartz of Sun City Center said, “I could basically just push a few buttons and be on the air.” Last month, he did just that. He pushed the buttons, and WSCQ Radio on the FM dial is broadcasting 24 hours a day, seven days a week out of the heart of Sun City Center. Swartz has been in the radio business for the past three decades, primarily in Christian broadcasting. For WSCQ he is emerging from his third retirement to operate the station, which now includes 11 volunteers — radio veterans and those from the community who have long dreamed of being a voice over the airwaves. So they may not play a lot of music by Rush, but the playlist does well represent the changing demographics, providing a little bit of something for everyone — from the new and ever-younger retirees to the Greatest Generation. During a recent interview in the station’s studio located in an office building just off Sun City Center Boulevard and North Pebble Beach, Swartz glanced up at the computer screen that was, at the moment, in control of the broadcast, and he stumbled slightly on the name of a singer. Volunteer and veteran broadcaster Frankie Vetrone, with 28 years of radio experience, including rock and roll stations, helped out with the name of the musician on the air: Sinead O’Connor. But that was just at that moment. In the mornings and afternoon there are live shows. On Saturday nights there is big band swing music. On Sundays, sermons from two community churches are broadcast. And among all of that is news from the community, the clubs and even features and events from The SCC Observer. There are talk shows and call-in shows. Although the station can reach into Brandon and down to Ellenton, the focus is on Sun City Center — and to Swartz and the rest of the crew at WSCQ, that means they are trying to speak to the greater community, including Kings Point and Valencia Lakes. The live shows encourage call-ins and questions, while providing information, such as scams that are currently going around attempting to take advantage of retirees through baseless threats, coercion and outright fear. The fledgling station is indeed becoming an unobtrusive companion with a friendly voice. At 9 a.m. on weekdays, radio veteran Frank Vetrone goes live with Judy Long for the Frank and Judy Show. Shows, music and weather fill in the hours, and the volunteers provide the voice-overs and the behind-the-scenes work that makes the magic happen. Swartz, a highly experienced radio engineer, oversees it all. He pushed the buttons. “This is a really good team,” Swartz said, beaming. Virtually everything he had hoped for back in March has now materialized. Although the station is not for profit, they always need sponsors for the shows to help cover the cost of operation. And with that, the Rush song, “Spirit of the Radio,” decried the commercialization of radio and music, at one point commenting on radio advertising “salesmen.” At WSCQ, there are none, there is no sales staff at all — there is just the hope that the community and area businesses will get behind them to sponsor their efforts. Regardless, their mission is to promote the community and the people and businesses that inhabit it. As a private entity, the radio station has no tie to the Community Association or to Kings Point, but Swartz is hoping to build relationships with the community leaderships. In promoting the community in a positive way, in reaching the residents, Swartz feels their missions are well aligned. Between shows on a recent Friday morning, the telephone used for call-ins went silent, and the computer took over the airwaves at 96.3 FM. 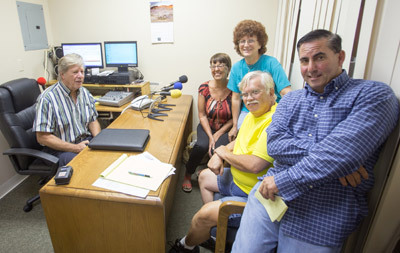 The volunteers — radio personalities, one a voice of their sponsors, another a writer — lingered around the small studio. There were jokes and laughter, along with serious discussion of things people in the community should hear about. And they will — live from the heart of Sun City Center. At WSCQ, the antenna is bristling and the airwaves have crackled to life. Hearing the music of the Canadian rock band Rush is probably a generation or two away, but the station is bearing its gift, and it is entirely free for anyone tuning in to 96.3 on the FM dial. , email info@suncityradio.net or call 813-294-5916. The station is always interested in any community news, club news and events. Church and club news is broadcast free of charge as a public service.